Frogs raising did not exist 20 years earlier. People caught them in the natural lakes, ponds, rice fields etc. The reason why farmers decided to raise frogs is that the population became endangered. The frog catchers catch big and small frogs and they almost became extinct. Of those frog raisers, some use it to supplement their daily diet wit necessary meat and others are able to raise many frogs so they can sell them an earn money with it. Thorough techniques for frog raising have not been disseminated to the people. Due to poor hygiene and the lack of knowledge on selecting frog raising sites, species and treatment for diseases, many people were not successful in raising frogs. Thus, the agricultural development committee has prepared a document on frog raising to promote successful frog raising so that it sufficiently supports the daily market supply. This document was used to develop the IBEC life skills manual. The manual on “frog raising” aims to help learners gain knowledge, skill, and experiences in simple life skills relating to their daily life. Frog raising can play an important role in the future lifes of young people and their families. Learning about frog raising from the young age links the need with the priority and objectives that help adults avoid unemployment caused by the lack of knowledge in the agricultural production. 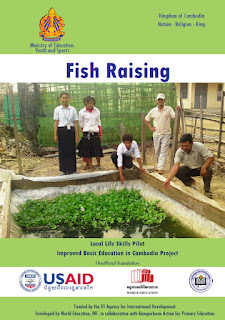 We hope that youth at present can think, plan, and wish to raise frogs including planning, budgeting, preparing materials according to the important stages so that this knowledge will prepare them better for a future career and outlook in life as well as making a direct impact in their current situation.